We've been baking halved Red or Sweet Onions for years (spritzed with olive oil, salt, pepper and grated Parmesan). Recently, we had the idea of baking them like blooming onions. They were beautiful and delicious! It's not really a recipe, but here's what we did. Preheat oven to 425ºF. Peel the small to medium size Red or Sweet Onions, leaving the root base intact. (I don't advise using large Onions because you need to give them room to bloom in the baking dish.) With the root base down, cut each Onion into "pie wedges", taking care to keep each wedge connected to the Onion. In a medium size bowl, combine equal parts of olive oil and your favorite balsamic vinegar. We used Blackberry Ginger balsamic vinegar. If you have plain balsamic vinegar, you could always jazz it up with a little blackberry or ginger jam. Submerge the Onion in the marinade, holding it down for a couple of minutes. Remove the Onion, allowing the extra marinade to drip off. Put the Onion in a large greased baking dish. Repeat, dunking each Onion. 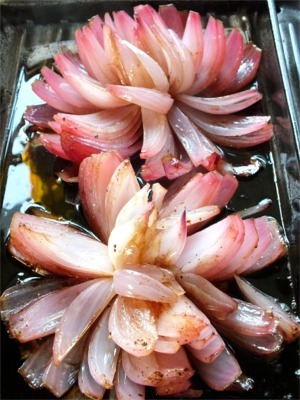 Make sure that they are spaced apart in the baking dish or dishes, so that each Onion has enough room to bloom. Season with salt and pepper. Cover the baking dish with aluminum foil. Bake at 425ºF for 30 minutes. During that time, I basted them a couple of times, quickly replacing the aluminum foil. Then, I basted them one last time and kept the aluminum foil off. I cooked them for another 5 minutes so that they became a little carmelized on the section tips. It makes a terrific presentation with grilled steak. You can serve it plain, or with a little dollop of our Cilantro Tzatziki Sauce.